First, we encounter the price. This cake is a very, very reasonable $16/200g xiaobing. Chawangshop is one of the few remaining outposts of tight, low prices for pu'ercha, and I am building in my appreciation for their output year on year. This year, it seems as if we have Laos cakes on sale - and this is progressive tea salesmanship at its best. The soup for this tea is a pollinated yellow, with a big, strong scent of grass - just as one would hope for Badashan tea. Pu'ercha from this area should be bigger and badder and rougher and tougher by definition. In the mouth, more grass, more sweetness; more throatiness with a long aftersweetness. 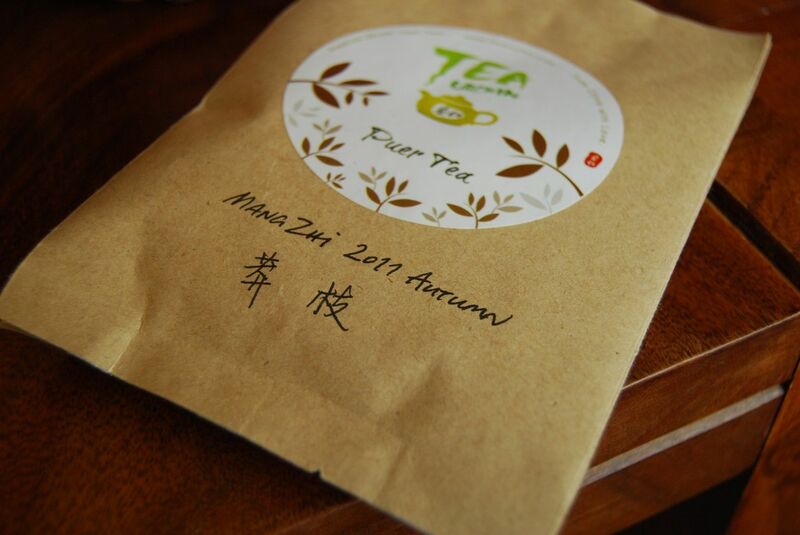 This tea comes from a small Bulangshan village. It is strong, clean, and enduring. Writing this article reminds me that I have not yet made a purchase. This is a fault that I quickly fix. 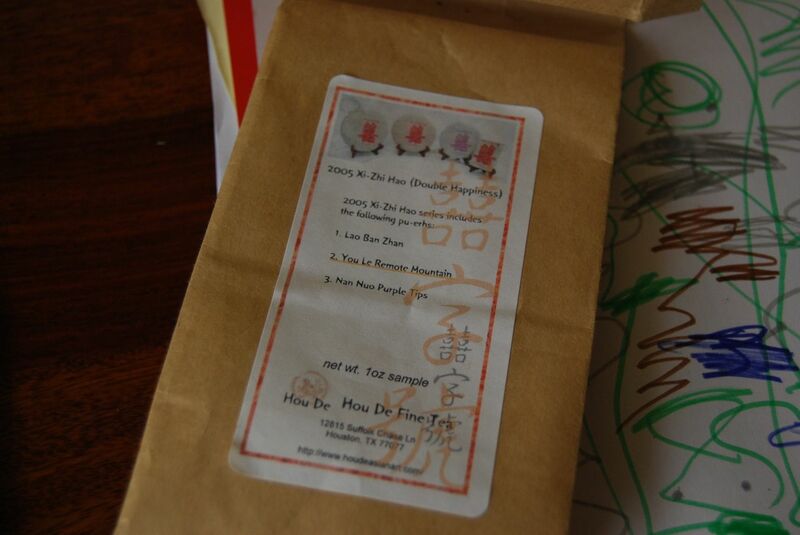 My first introduction to this tea came from The Jakub, who kindly brewed me a cup. "It tastes like old-fashioned tea" was my conclusion after a sip, and this held after my subsequent session at home with the sample that he then provided. 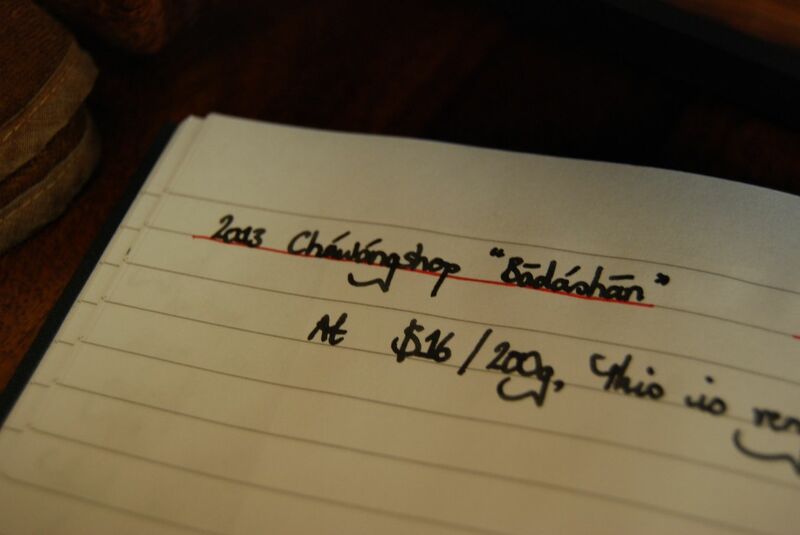 Edit: this tea is the "2013 Laoyu Badashan" and not the "2013 Zhanglang Badashan" - thank you to Honza for spotting that before I bought the wrong thing. As I mentioned in a previous post (the 2012 Yudou), the Yudou is nominally at the upper end of the Douji range of blends, before we start getting into the (now really rather expensive) range of single-mountain cakes from the same producer. 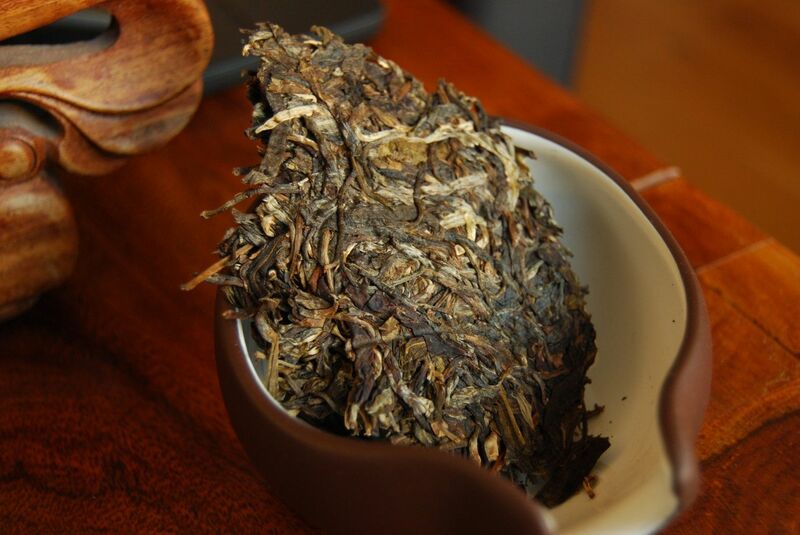 In 2011, the blend for Yudou contained Mengku (Lincang diqu), Hekai (Menghai county), Mengsongshan, and Youleshan (Mengla county), where the latter three are all 'Banna regions. This is a big old blend. My first impression is that the leaves look really rather nice, for a company blend. When The Dou wants to make nice tea, they certainly have the capacity to do so. (Especially when it comes to tea that they will not sell.) Today, however, the prettiness of the blend seems to be at odds with the quality of the tea. There is a heavily subjective element to pu'ercha, and tastes in general, with a significant amount of inter- and even intra-taster variance. Taken on any other day, this tea may have performed better than it did for me today - however, what I have in the cup right now is good old-fashioned plantation tea. It is as rough as the proverbial French lady's legs. The same blend from other years appealed in ways that this 2008 version do not: it is imminently forgettable, which is a shame, given my long-term affection for being Doujified. I remain thirsty. This curious effect, Stockholm syndrome, refers to the fact that captives (in approx. 8% of cases, according to Wikipedia) may develop positive bonds with their captors. 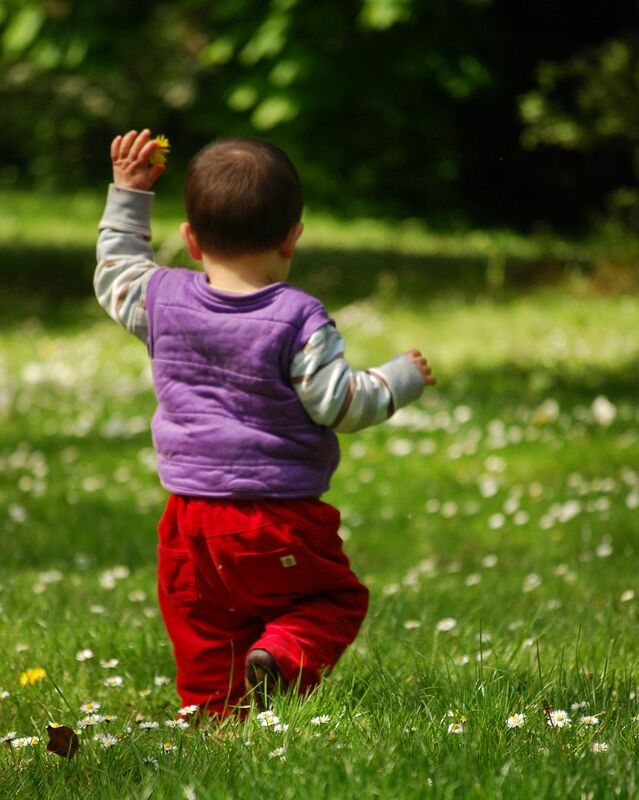 It is not clear if this effect is more prevalent among residents of the Swedish capital. Long-time readers of this humble web-site may recall mention of my spending time with a cake while we moved house one year. During that time, our tea collection was in storage (of an inaccessible variety), and my tastebuds were held captive by a single bing. This article is about that bing, which I seem to have not tried since that special period in my life. The leaves of this old friend of mine are small; it is easy to overbrew, because I tend to use too may leaves when they are small. Looking at the photographs above and below, you might immediately recognise the typical "Dayi" appearance of the cake. This is an advantage if, like me, you are rather partial to the straightforward-yet-appealing charms of this factory's output. They are cheap and, often, very cheerful. Well, they used to be cheap. This cake certainly was, at £9 back in 2009. What can you get for £9 these days? This time, I win: the first infusion is sweet and well-structured. 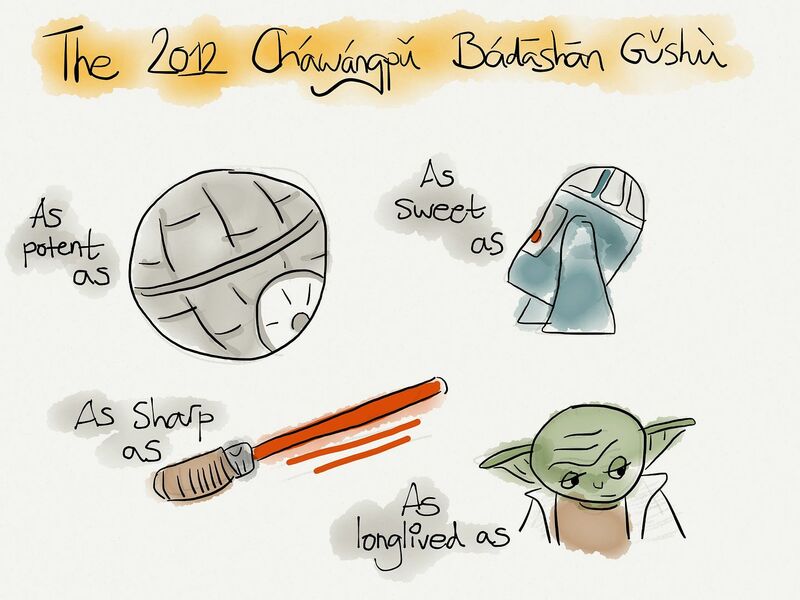 The grassiness of Badashan is a charming addition to the usual house style. The finish is sweetly resonant in the throat, which is likewise fine. We have the complexity of old honey; this cake benefits from attentive, slow consideration. While this tea is not, objectively speaking, the biggest ninja in the clan, it holds special appeal with me, which brings me back to Stockholm syndrome: I spent so long with it, and drank nothing else but this tea, that it has defined "Badashan" for me. All Badashan cakes subsequent to this are immediate in their comparison: I was going to write that "it is like one's first girlfriend", but then I decided against it. This cake is aging nicely, and whether or not it is "youjicha", it certainly has its virtues. 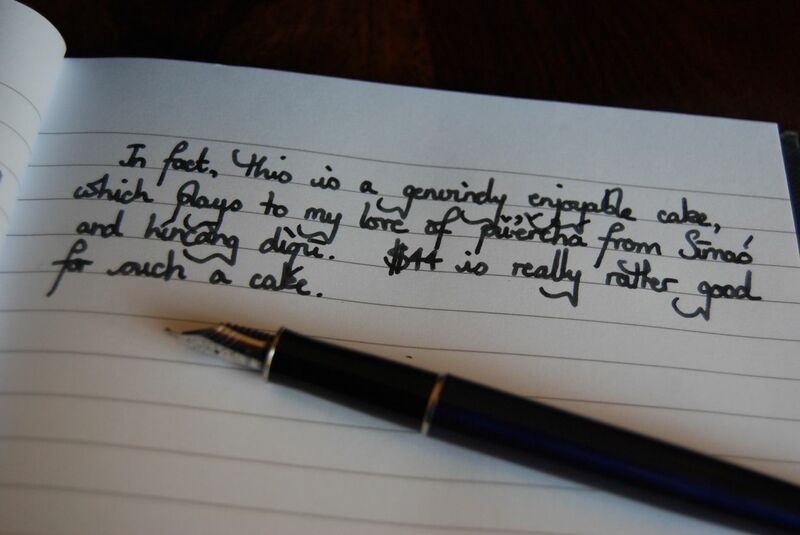 When weighed against the fact that it cost a hideously offensive nine (9) English pounds, and the fact that it has such a unique place in my heart despite so many good cakes that have come since, we cannot conclude anything other than that this cake is mighty fine. Try some - I'm sure it's available somewhere, for lovers of basic but reliable Badashan tea. It used to be available all over the place at one time. I have received a goodly quantity of positive feedback for my previous foray into the nether-regions of my shelves and I am, Gentle Reader, always configured for maximal response to positive feedback. 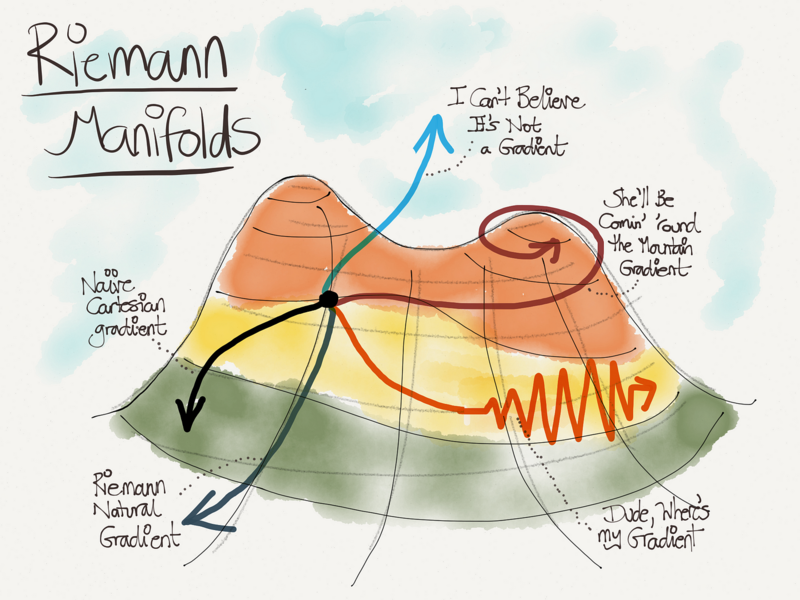 If that makes me an unstable system, then may my poles will always reside in the positive half of the s-plane. I have been revisiting some of my old teas, with an emphasis on the more trustworthy, reliable cakes that I know will deliver the goods. This makes my sample biased, and I am fine with that: the goal, after all, is for good sessions these days. Perhaps the most pleasantly educational encounter in the list below was that of the 2005 Xiaguan: this was a cake that was as black as an investment banker's soul when it was young, but which has matured so pleasantly that I am now wondering how my other "black" Xiaguan cakes have turned out. 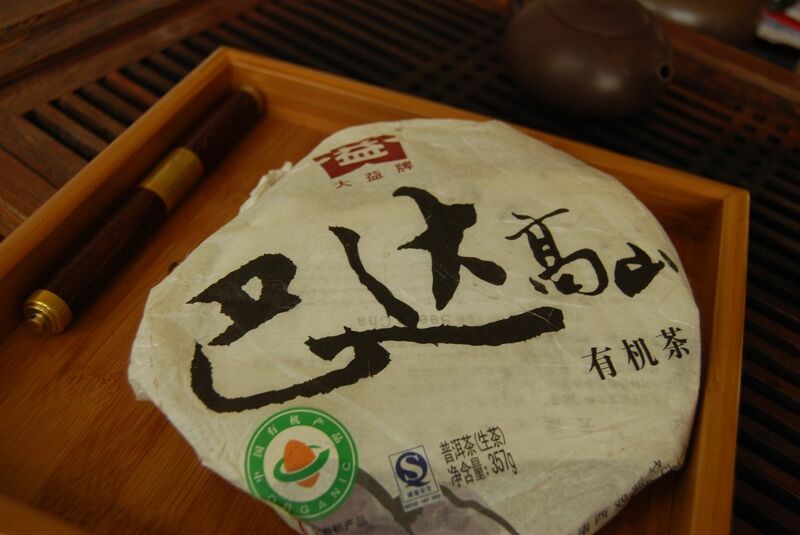 2007 Changyai - Yichanghao "Yiwu": sweet, heavy, solid, and aging despite being sealed in plastic. 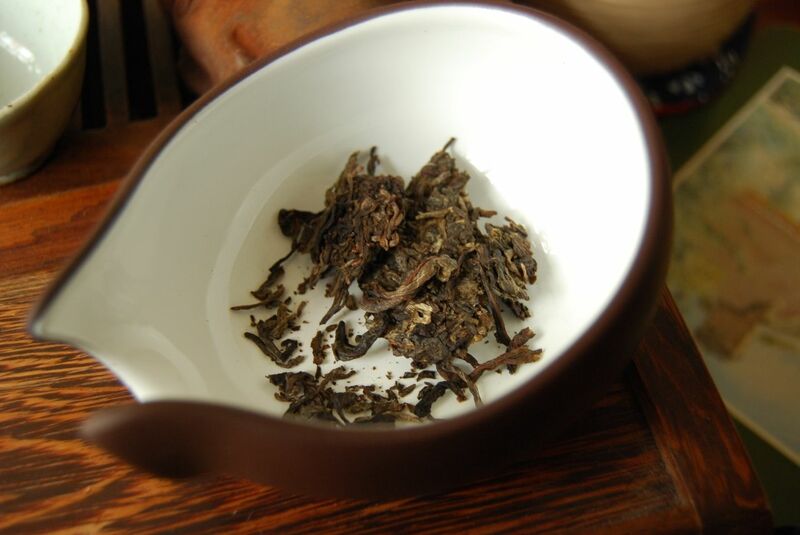 2003 Changtai - Qianjiafeng "Jinzhushan": excellent tea. Orange, heavy, and long-lasting. 2005 Xiaguan "8653": modern "black" Xiaguans can age well, it seems. 2008 Shuangjiang Mengku - Muyechun "Laoshu Qingbing": basic pu'ercha dressed up with purple tones, this is aging slowly. 2008 Menghai - Dayi "8582": in preparation for the arrival of a large purchase of 2008 8582, I try some of my own cakes. They are coming on nicely, and provide basic Menghai richness. 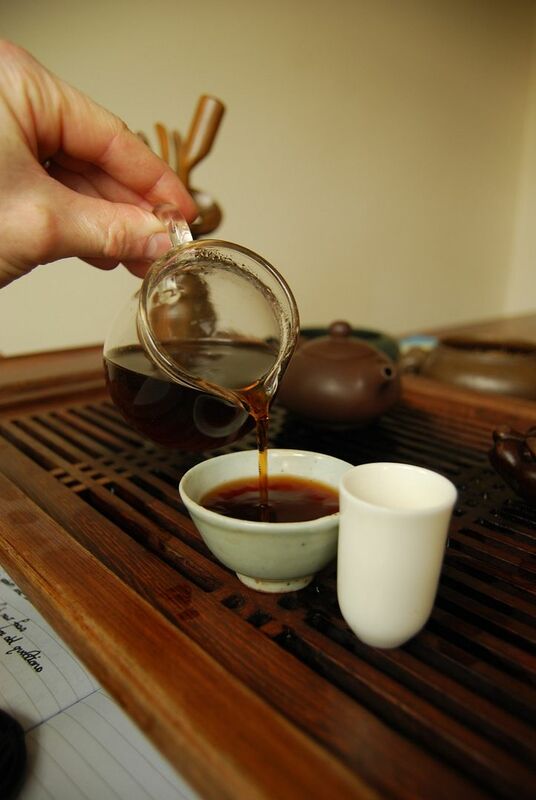 2004 Changtai - Yichanghao "Yiwu Zhengpin": red, malty, and smooth, this is "old fashioned" tea of a reliable kind. As ever, the new notes have been appended to the original articles, linked above, and so I invite you to scroll down when opening these pages. A tong: let's open it. I have been drinking some old samples, and tidying away a few loose ends. In each case, please see the main article for further details by clicking on the link (and where new notes have been appended in each case). 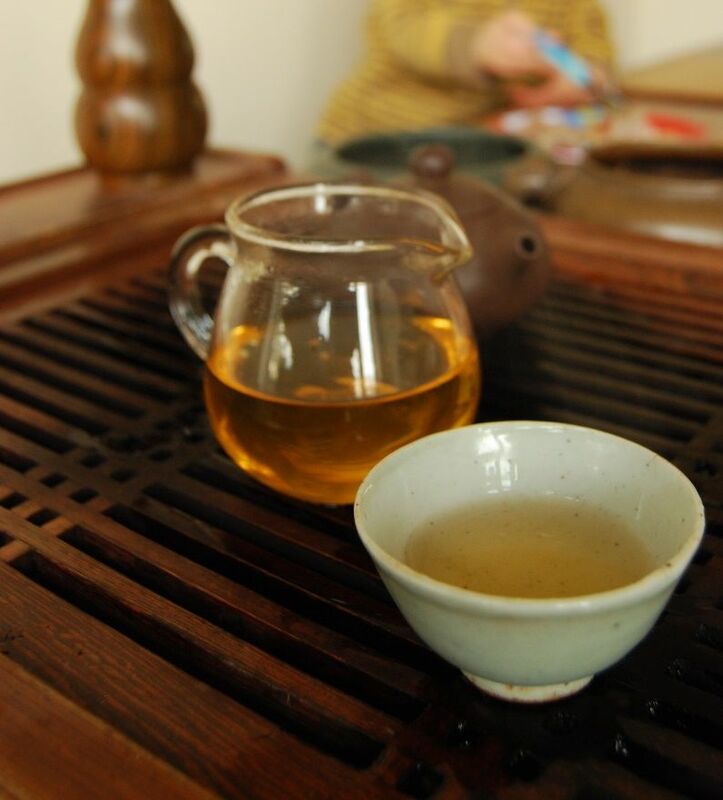 2009 Changtai "Zhenpin Banzhang": this was, initially, a basic tea, and where five years on our shelves has brought it on well - even from a humble start - which is encouraging. 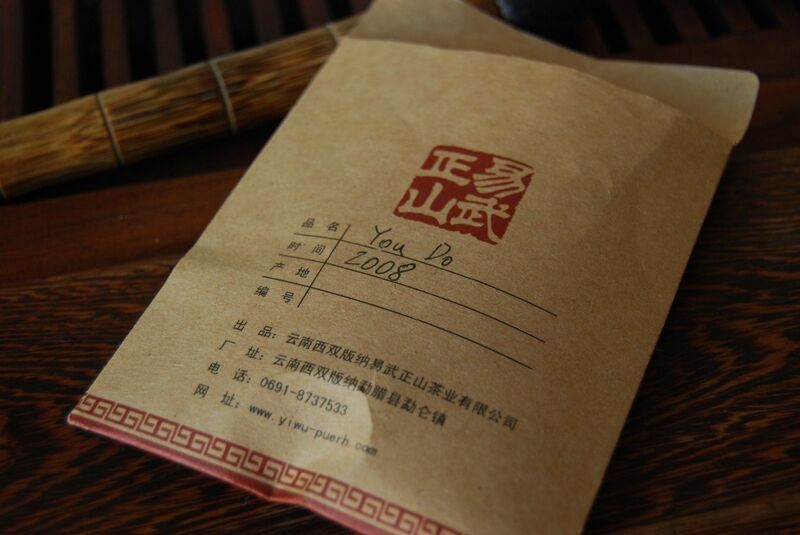 2003 Menghai "Yiya Yuancha": this is a monster-box tea, kindly provided by a visiting friend of ST, from Singapore. 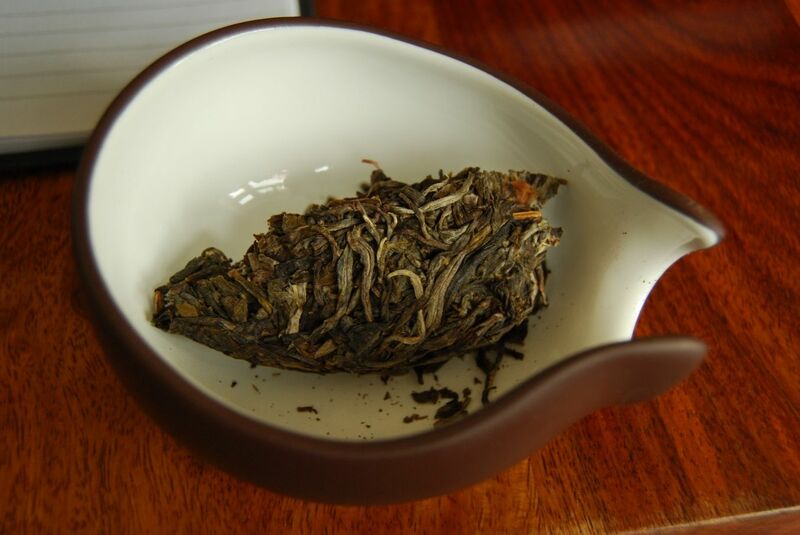 It started out as a silver-bud tea, but has, unexpectedly, developed a thick sweetness as of "real tea", as if the silver buds are being outpaced by the standard, basis leaves included in the blend. 2009 Xizihao "Pasha Laozhai": while it starts out strong and uncompromising, it rapidly becomes unentertaining and rather tedious. Its qualities are not long-lived. 1998 Menghai "Yesheng Qiaomu": this used to be good, and it still is, jinhua and all. 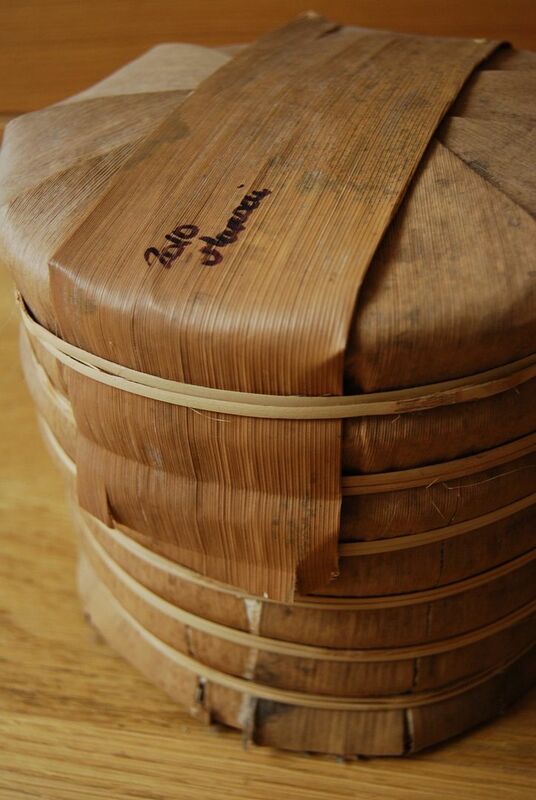 It has been aged for most of its life in Hong Kong, and retains much of its damper, hotter charms. 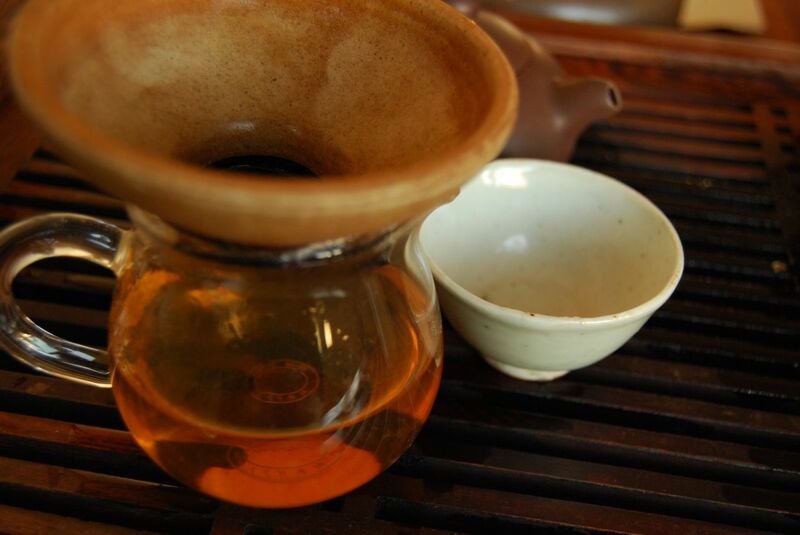 1986 Sunsing "Yiwu Chunya": a formidable tea, this lasted three whole days of almost constant brewing. This is well worth pursuing, if it is still available at Sunsing. 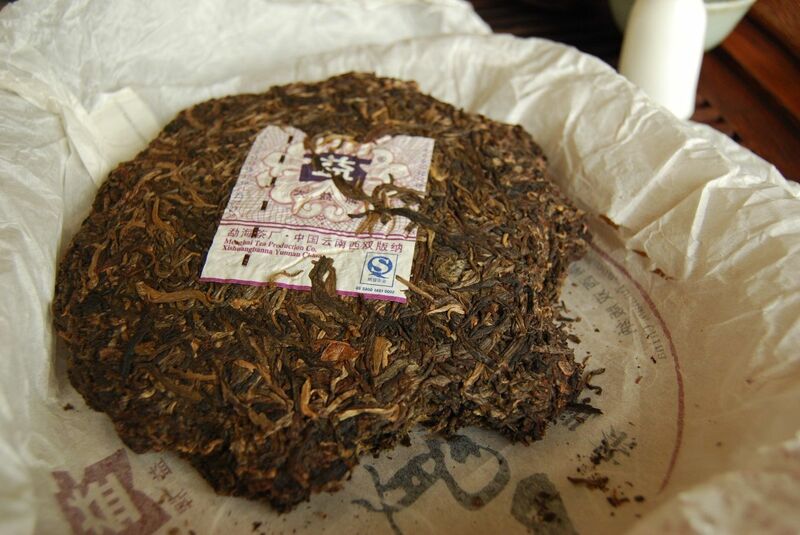 2010 Douji "Demingxuan": when Douji makes cakes that are "not for sale", I take notice - despite their prices, the Douji brand is, at minimum, quite reliable and, at best, really rather potent. This is a fine cake - if only it were more generally available. How on earth I managed to have entirely missed a sample of "XZH" is beyond me, but missed this 2005 Youleshan I appear to have. Its presence, nestled in the far-off recesses of the darkest parts of my collection, suggests that I have had it some time - as does the layer of dust. Today, archaeology! I need something low-risk today, and nine-year-old Xizihao fits the bill. 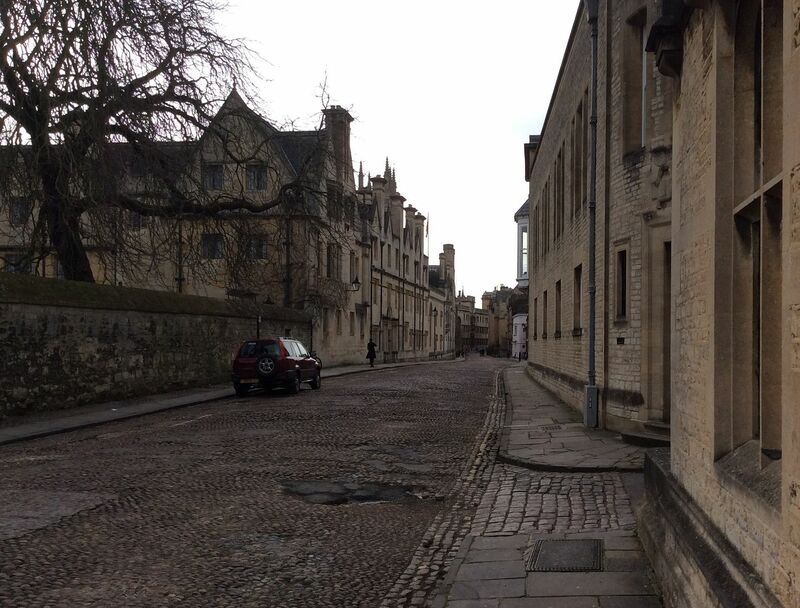 I have just finished preparing for my first University-level examination, in which some poor student gets to spend three hours with me and an external examiner, dressed in comedy Elizabethan costume, defending his work. As if rebutting our probing questions weren't bad enough, doing it in comedy clothing really takes the cake. This cake seems to contain a little of everything: basis leaves, huangpian [yellow flakes], furry tips, little stems. Perhaps "rugged" would be a good description of the maocha used to make it. As ever, Sanhetang, the producers of this brand, demonstrate that they know how to press leaves: the result is thick, strong, and sweet. Despite the fact that it has spent its existence in a tiny paper bag, here in England, for its life, the leaves have aged well. 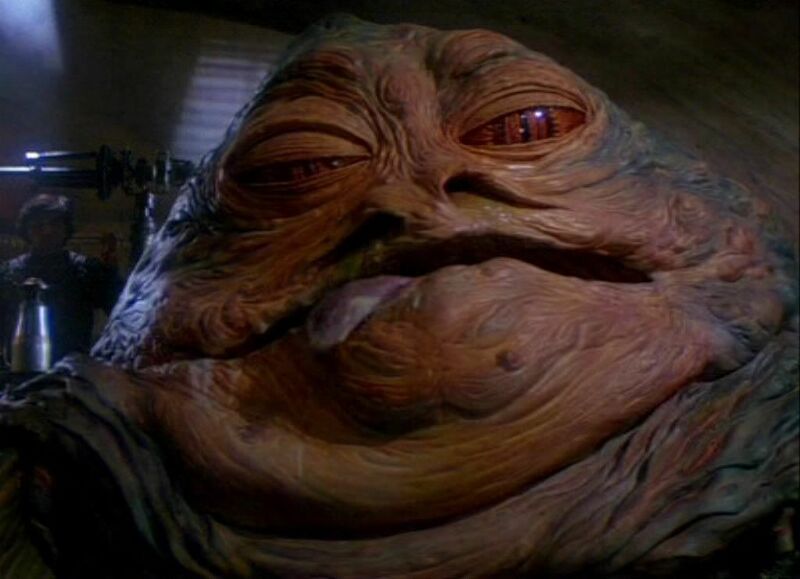 There is a clean, orange soup (pictured below); the character in the mouth has a solid base of dark pu'ercha, with a long, unhurried fragrance of orthodox 'Banna tea. 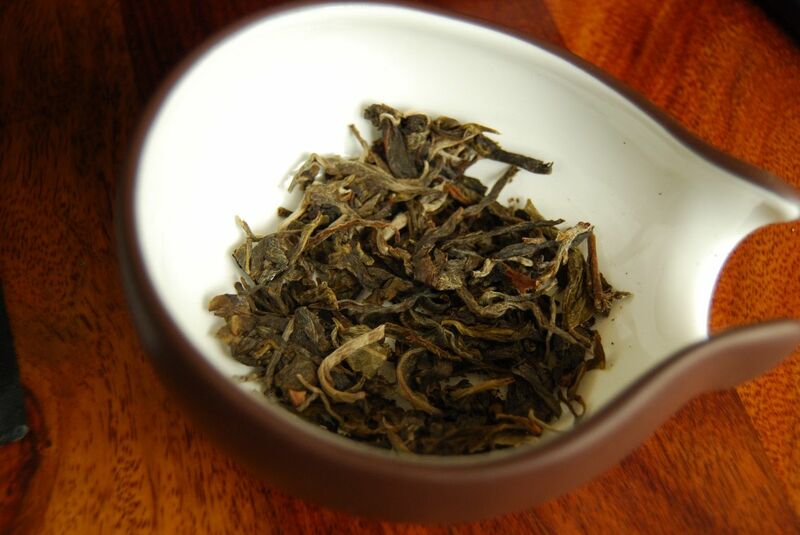 After some infusions, I conclude that this tea is not outstanding - there is a tangy note that I do not enjoy, that has crept into later infusions, along with the naked roughness of plantation leaves. I am just about resolved to ditch this tea and try something else and then think: "No, this is today's tea, and I am going to stick with it." There follows a further dozen infusions that are generically sweet; brewed carefully, the plantation notes can be contained. 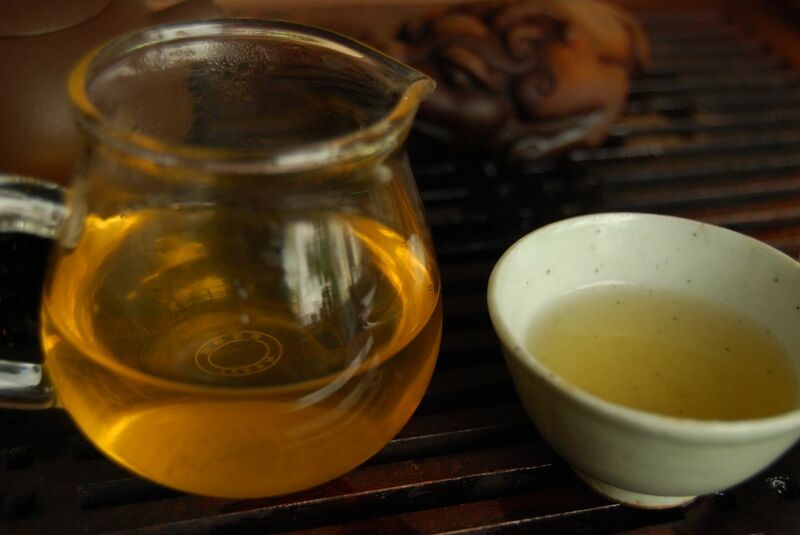 It is not Xizihao's finest hour, but it is not without virtue - particularly during those first infusions. TeaUrchin came into existence, I seem to remember, in 2011, where at the outset of the venture, its owner kindly sent me a clutch of samples. This little packet represents the last of them. 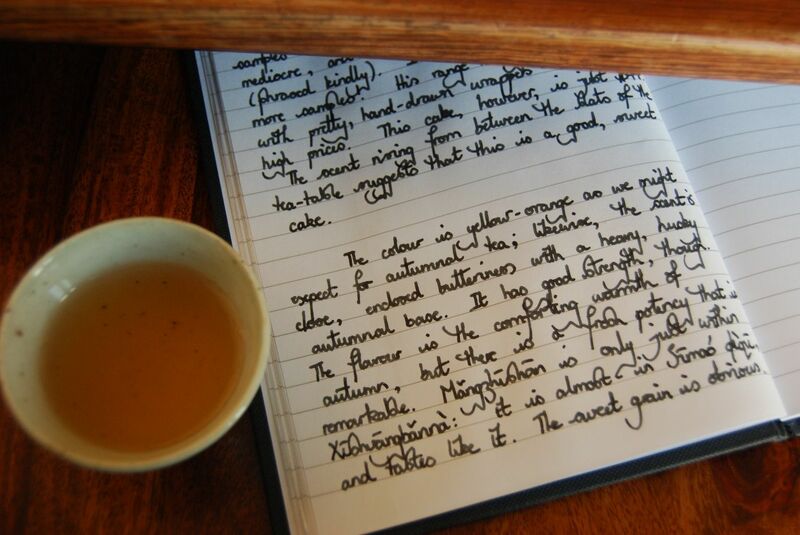 I notice that the web-site remains probably the prettiest of all those of the vendors of tea, and this aesthetic style continues to the wrappers of the various cakes that TeaUrchin appears to have made since 2011. 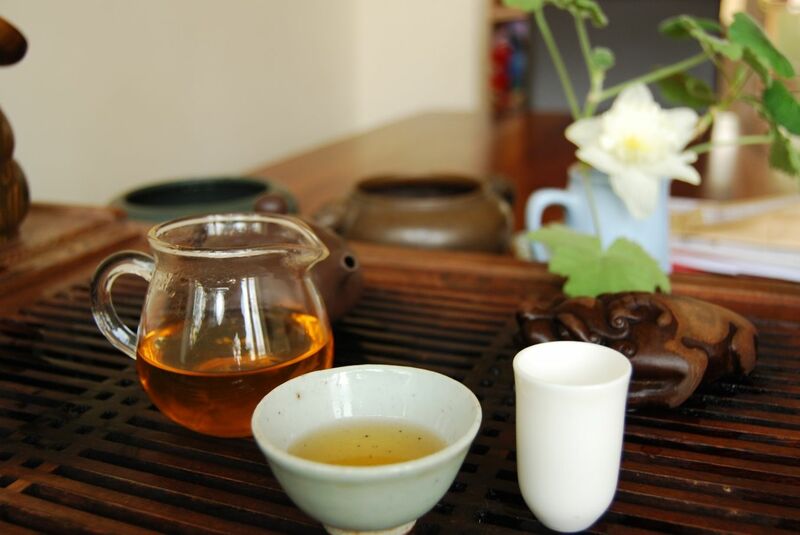 Mengzhishan is only just inside the borders of Xishuangbanna: it is right up there, on the border with mighty Simao diqu, where the teas are savoury and the prices are not quite as high as in good old 'Banna. 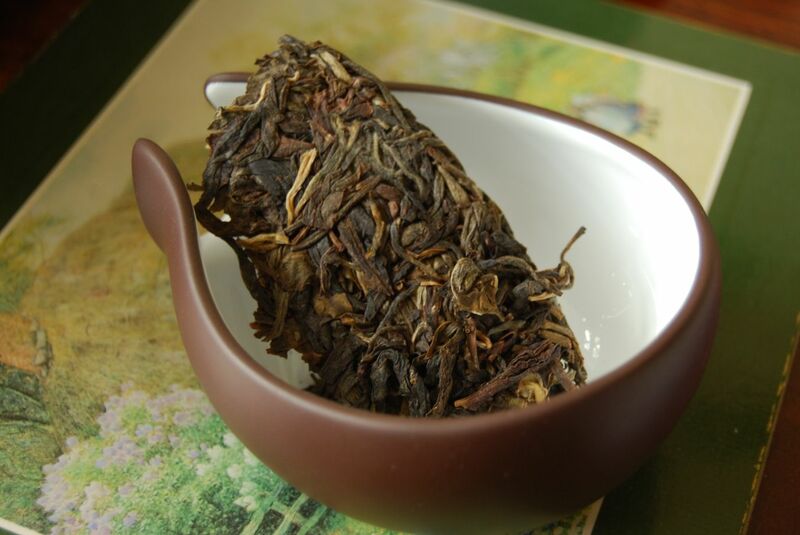 Long-time readers might know that I harbour certain affections for teas from Simao - they can be burly, chunky, rough (in an endearing way), and those that I have in my collection seem to be maturing nicely. 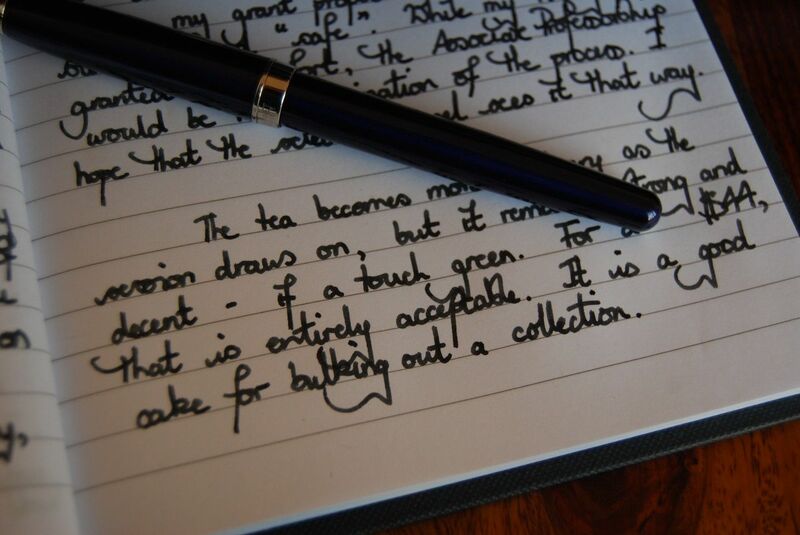 Questions remain about the autumnal leaves, as ever, but the scent that rises from between the slats of the tea-table, after the rinse, suggests that this is a good, sweet cake. The colour (pictured above) is yellow-orange as might expect for autumnal tea; likewise, the scent is a close, enclosed butteriness with a heavy, husky autumnal base. The flavour is the comforting warmth of autumn, but there is a fresh potency that is remarkable. 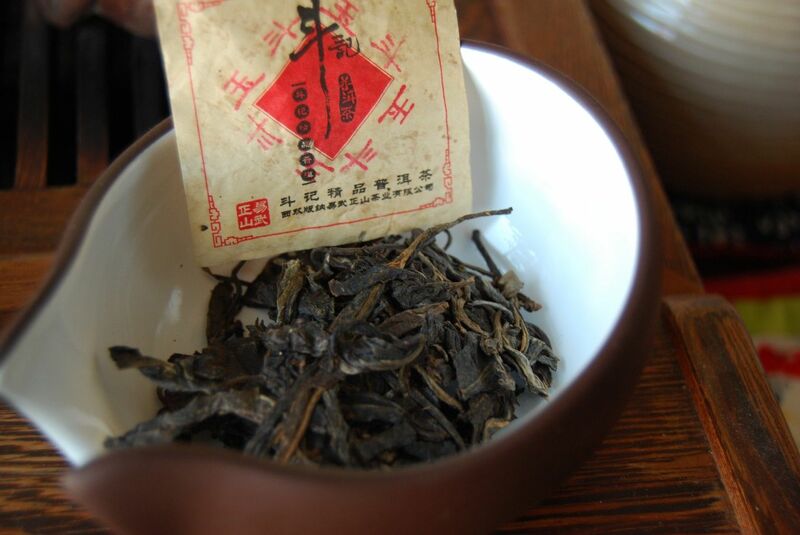 The sweet grain of Mangzhishan is obvious, and welcome. In fact, this is a genuinely enjoyable cake, which plays to my love of pu'ercha from Simao and Lincang diqu. $44 is really rather good for such a cake. 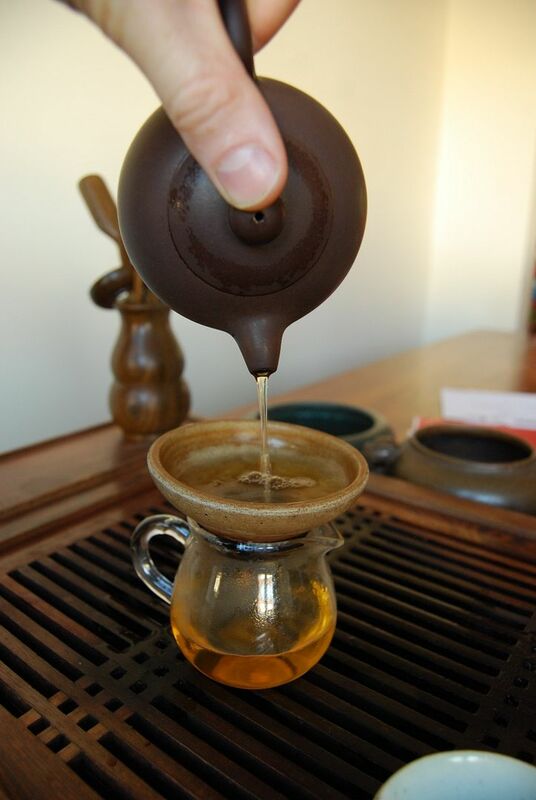 The tea becomes more ordinary as the session draws on, but it remains strong and decent - if a touch green. For $44, that is entirely acceptable. It is a good cake for bulking out a collection, and is perhaps (if memory serves) my favourite autumnal cake from that set produced by TeaUrchin back in 2011. Gentle Reader, if you have any further experience with cakes from this vendor, for comparison, I would be delighted to hear your reports.